Kilinochchi, a Sri Lankan district capital since 1980, is the northernmost significant town of the Vanni region, which includes all areas of the Northern Province on the mainland except from Jaffna Peninsula (which in fact is an island). The town was established under British colonial rule in 1936 to reduce an overpopulation of the Jaffna Peninsula. The separatist rebel army LTTE occupied Kilinochchi in 1990. The Sri Lankan army regained control in 1996. Kilinochchi fell again into the rebel army’s hand in September 1998. During the final year of the civil war, when Jaffna was under government control, Kilinochchi was the de facto capital of the separatist army LTTE. Before the Sri Lankan army recaptured Kilinochchi in the final stage of the civil war in 2009, the LTTE, when leaving the town, forced large parts of the population to come with them to their last stronghold near Mullativu to serve them as human shields. 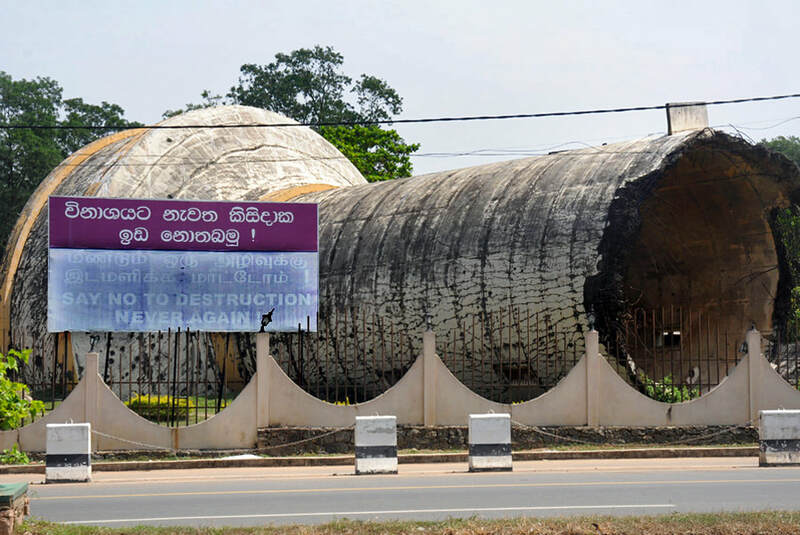 Using a kins of tactic of scorched earth, the LTTE destroyed the city’s water supply be bombing the water tower, just before fleeing the city on 31st December 2008. As fresh water is a scarce ressource in the Vanni dry zone, this act of terrorism deprived the citizens of drinking water. They had to collect water from the tanks, which increased the risks of waterborne diseases. The central government, with assistance of the government of Japan, built two new water towers and water pipelines in the Kilinochchi area. The fallen water tank was left as a memorial of the destructive forces of war. In 2014, the broken water tower was fenced off and turned into a monument officially.